Rejoice in hope, be patient in suffering, PESEVERE in prayer. that person will receive the crown of life that the Lord has promised to those who love him. As you know, we count as blessed those who have PERSEVERED. 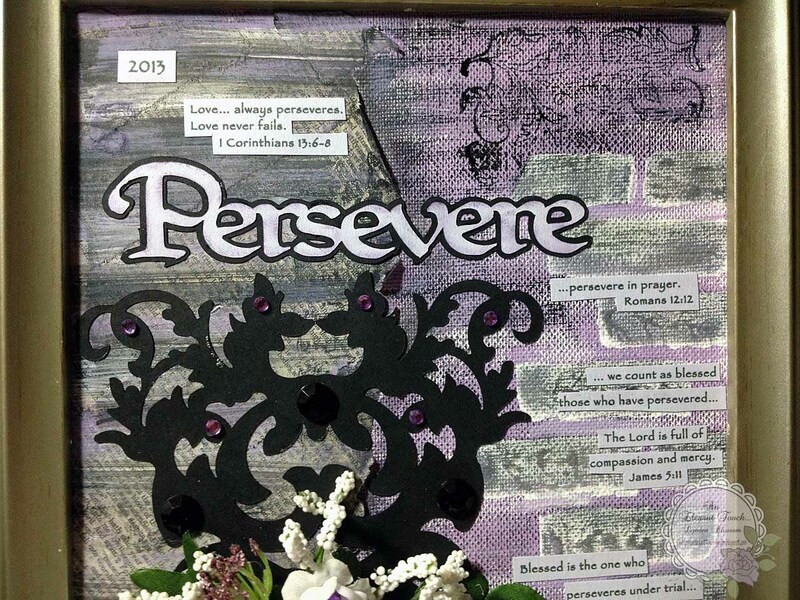 You have heard of Job’s perseverance and have seen what the Lord finally brought about. The Lord is full of compassion and mercy. 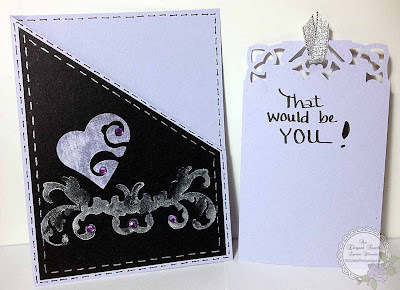 Welcome to our 2013 Die Cut Tuesday New Release and Link UP over at MyPaperCrafting.com! 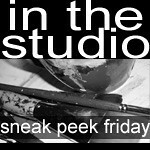 Be sure and pop over there and see what Melin has set up for this Showcase – and the New Release. For today, I chose to make something for ME! – which is quite unusual for me to do, as I’m always making projects of one kind or another with Someone Else in mind to give or send it to. I heard last year - about mid-way through – about choosing a WORD for the Year – and have heard much more about it since. I decided to choose one for myself for this year and I thought long and hard about it before deciding on one. I have had some extremely difficult years recently and things have been even worse I the past several months. It seemed that wherever I looked or read, I was being ‘told’ to keep going no matter what…something I’d really rather NOT do many days, although I do keep trying… SO. I decided to choose the word, ‘Persevere.’ I looked up the several verses above and decided to use them in this week’s project. I watched an online video recently on how to use various techniques to make a large tag. 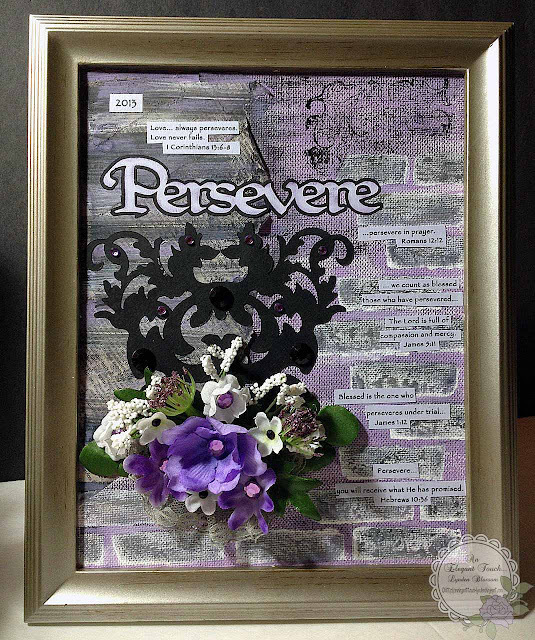 I really liked the techniques and the outcome – and decided to use the techniques to make a framed piece for ME to look at daily as an encouragement. I’ve also spent Lots of time learning how to use my ‘new Silhouette CAMEO’ – that I’ve had since Summer, but haven’t actually used until this week, as it was quicker/easier to use my trusty ol’ Cricut/SCAL2 for all the many things I’ve done the past few months ‘in a hurry.’ I will use the SCAL3 program with my CAMEO and although they are both different in many ways, I have been quite pleased with how the CAMEO has cut the delicate cuts I’ve done this week! ;-] Treats to ME - for the Project – and for using my CAMEO! 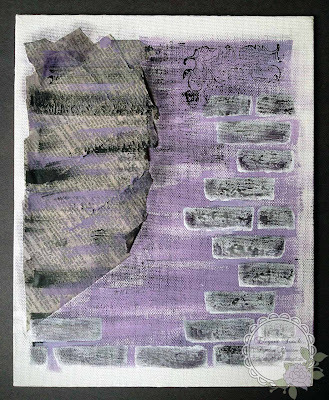 * I applied Gesso to the canvas – and let it dry. 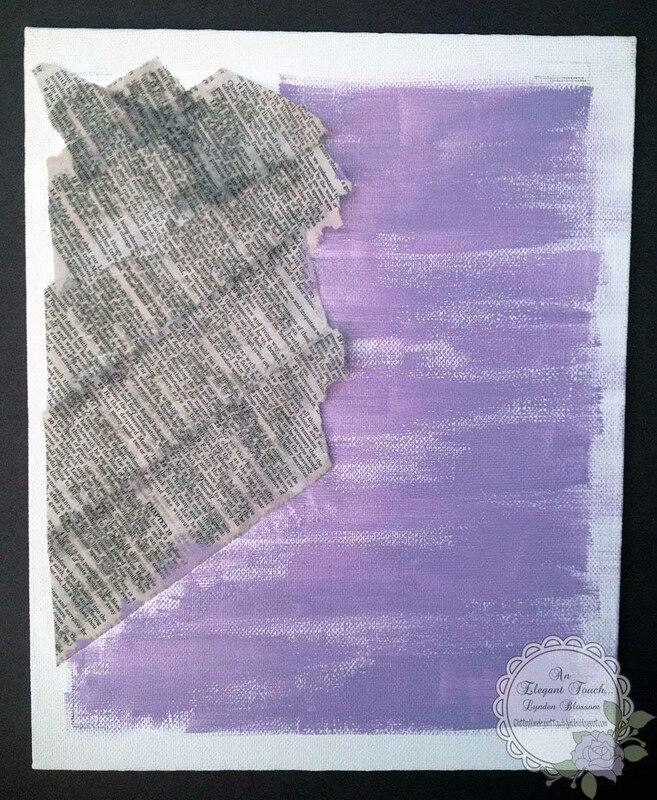 * I ripped a page from a $$Store (poorly printed) paperback Bible that I bought to use for Projects. I ripped it into strips and applied them diagonally to the left side of the canvas with my Homemade Mod-Podge. 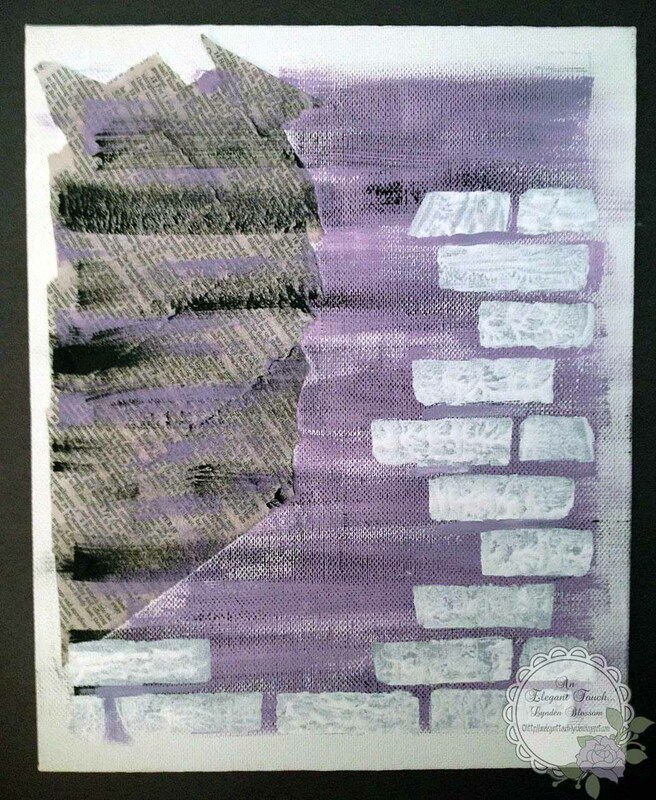 * I applied lavender acrylic paint lightly to the right side of the canvas. * I dry-brushed with black and then white lightly here and there. I roughed the edges of the dried paper edges. 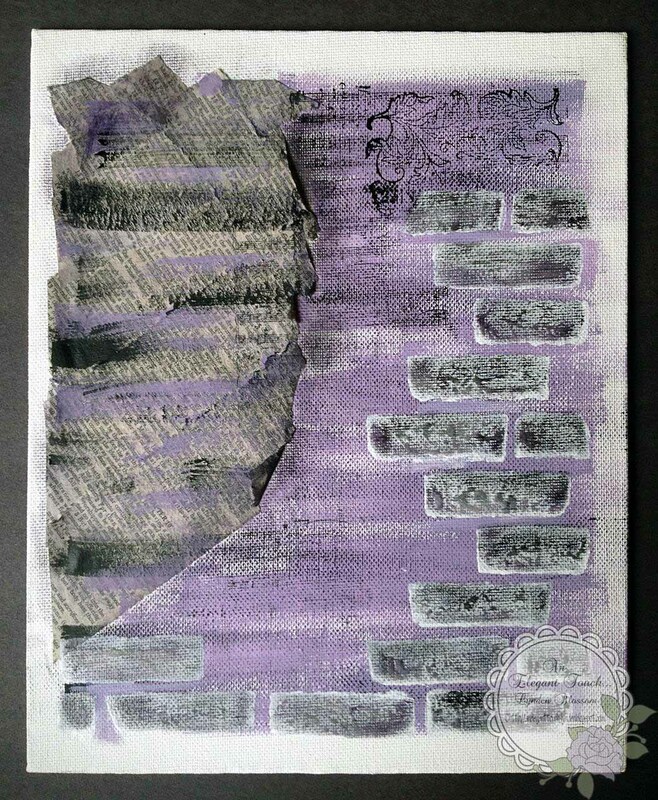 * I used the Brick template and Gesso to make the brick wall on the right side. * When that was dry, I inked the bricks with black and then purple lightly. 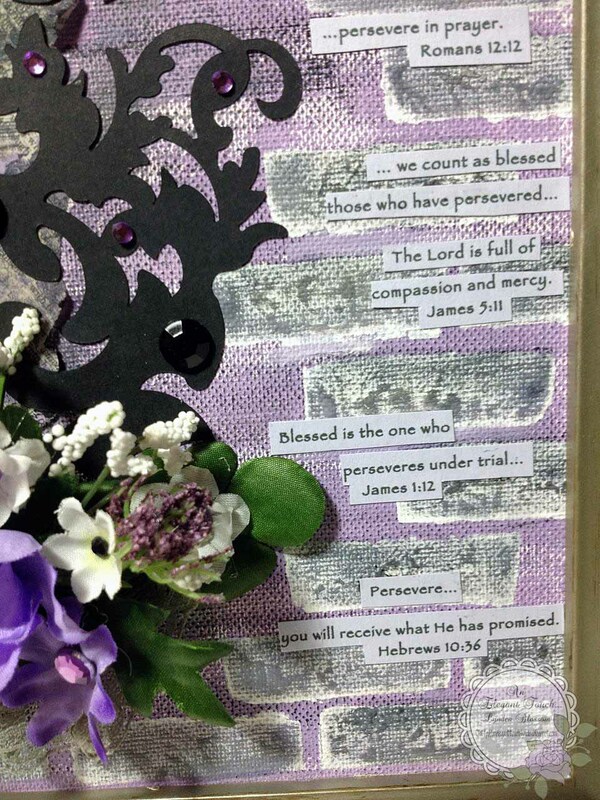 * I printed the Verses in WORD (Papyrus font), then cut them in sections and adhered them. * I placed the finished canvas into the frame – and there it is! 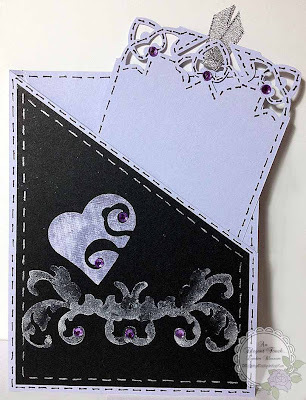 Be sure to check out Melin’s post for the FREEBIE File for today and then make something and link up there. I look forward to seeing YOUR creations! * I began with Lavender cardstock – an 8.5 x 11” piece, cut in half, to make 4 ¼ x 5.5” piece. I folded this in half, then cut a wedge (top left corner to 3” on right edge) out of the front side to make a pocket for the Tag. * I cut a piece of Black cardstock to fit the front of the card. * I adhered a Flourish from the ‘Flourished Baroque Elements cf2’ – and a Heart from the ‘I Heart U’ cutting files. * I made a tag to fit into the pocket. 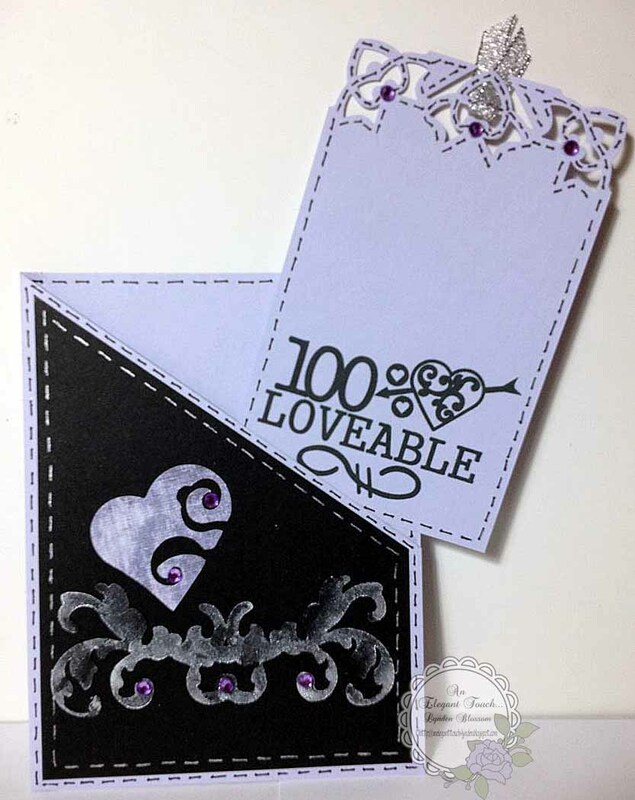 I printed the ‘100% Loveable’ DS on it. 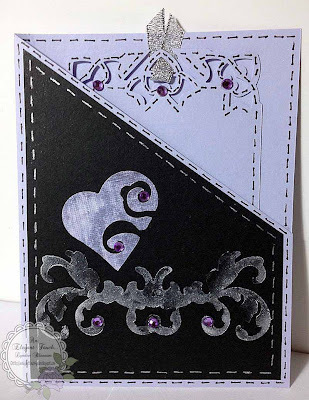 I used a MS ‘Heart Corner’ punch on the 2 top corners and also in the middle. I printed, “That would be YOU!” on the back of the Tag. 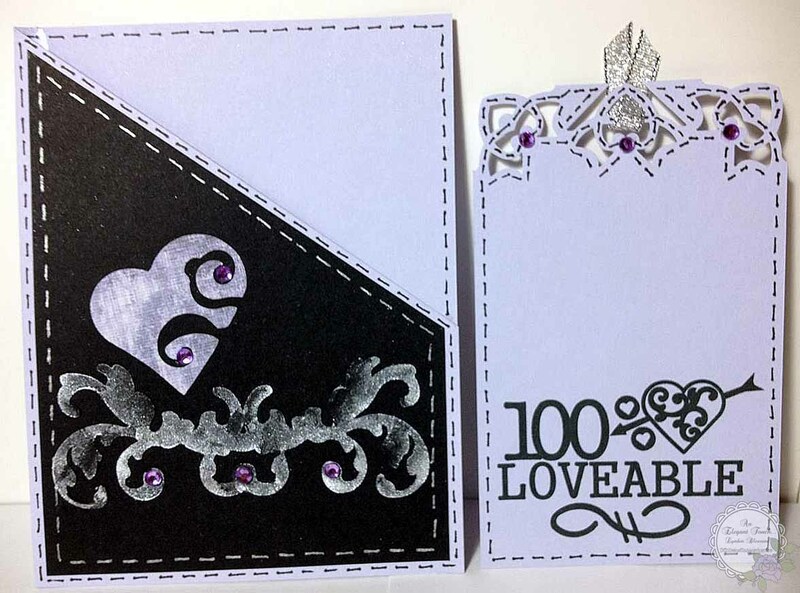 * I added Lavender Gems (Recollections) and Hand Faux-stitching in silver and black to the Tag and the Card. I added a piece of Silver ribbon to the Tag. * I glued the sides and bottom of the Card and then inserted the Tag. Here is the FREE digi-file for this week at My Paper Crafting. Be sure to stop over there, if you haven’t already, see all of the other creative projects, get the file, make a project of your own using a digi-file from My Paper Crafting and then link it there so we can see it, too! I'm so excited to tell you about a new twist this term. We invite YOU to participate in our Digi Dessert Fridaze weekly posts. 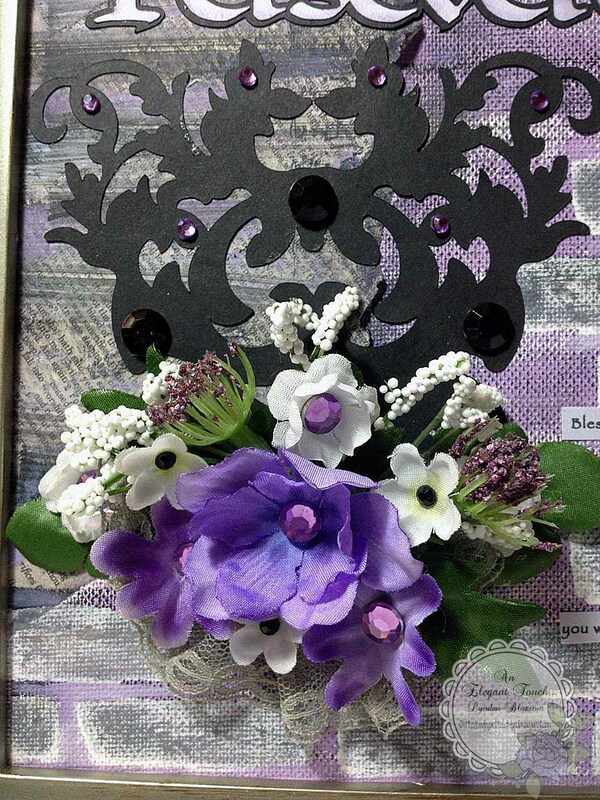 Just create something using a digital image and link up at the end of the post. If you use a Paper Crafting World image, you will receive 2 chances to win. That's right! 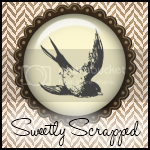 One lucky project will be selected each week to receive a digital image from Paper Crafting World. If you use a PCW file, please add PCW after your name. 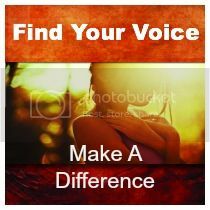 And, it will be so much easier to participate with our Link Up because there's a tab on the home page that will bring you directly to this DDF page. 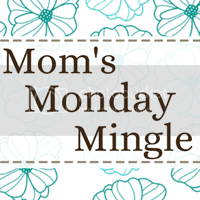 You'll have until Thursday 12 noon (EST) to link up. The lucky winner will be announced in the next PCW post on Friday. 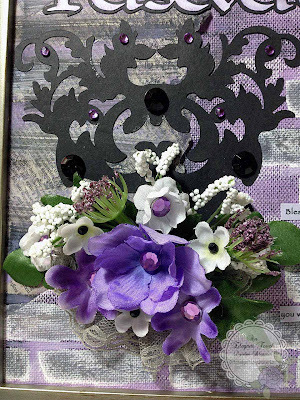 Be sure to come back here often as I showcase other Paper Crafted Projects and Photo Digital Restorations that I make – several days each week. 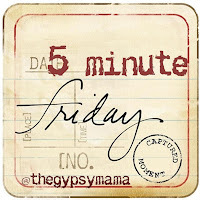 Sign up to receive my Posts so you’ll know when I’ve posted something – usually 3 to 4 times weekly. Check out my Tabs in the Header above to see what else I do and can do for you! Let me know if you have questions on anything here – or if I can do anything for You! Have a Great Week! See you again soon!